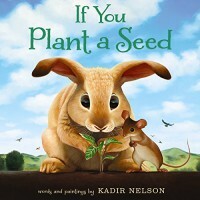 Gorgeous illustrations as always from Kadir Nelson, but in addition to that, IF YOU PLANT A SEED has a wonderful message about sharing. There is one illustration of their birds looking at the mouse and rabbit that I love!! You can totally read their expression saying, "Hey, can we have some of that?" Definitely one to purchase.